I first met Nancy & Pearl of the Mersey Belles at the Big House event in 2015. I think I had seen some Youtube videos of them before that, but when you meet them, you can't help but be infected by their sense of fun and continuous smiles. They helped me with some singing technical stuff and confidence, for which I'm eternally grateful. Back then, they were pretty much known for their covers of (mostly) traditional, well known songs, with the occasional modern one ("Toxic" is a delight) thrown in for good measure. Close harmonies are their trademark, and this is very evident on this EP. But, they've gone and got all clever on us. They've written their own songs, and as has been my experience, when you write your own stuff, it's easier to perform, you have more feeling, and it comes across better. I think that's happened here, I was absolutely blown away with what is a huge step up for this likeable duo. This EP has five very well crafted and produced tracks. It's recorded in a studio, but they've resisted the temptation to overly multi-track things, anything done is very subtle. Although it's recorded in a studio, it's been kept very 'real', if you listen carefully, you can hear them counting in, breathing, even an occasional 'clunk' - although not distracting. Here's a video that the very talented Liam Capper-Starr made for them for the track "Hurry Back To Me", so you can get a flavour of what's on the EP. This is one of the three originals on this EP, the others being "Melt Away" and the eternally catchy "I Said Ooh". "Say Something" is a cover, but better than the original, they've somehow added something, and changed the simplicity of the song. If you are (or are not) a fan of Adele, the mashup of "Hello" with "Pass You By" totally changes the way you understand the song. A brilliant arrangement. From a very competent duo doing very competent performances of songs as covers, the Mersey Belles have raised the bar dramatically and shown what they really can do. It's just breathtaking. I can't wait for a full album. 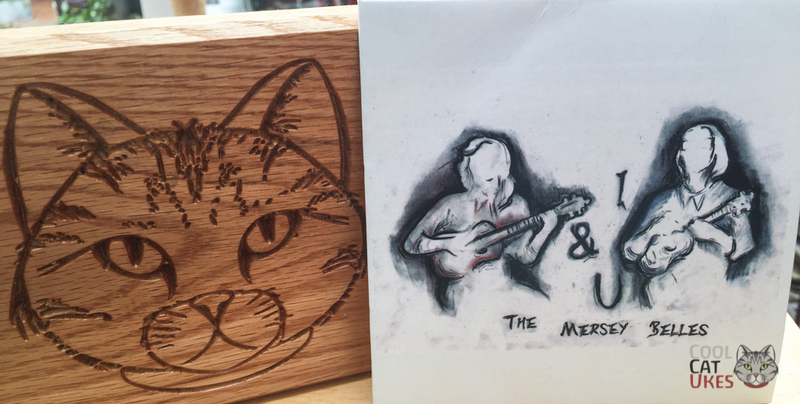 I'm not sure you that can buy the CD online, but you can buy it from them when you see them - at many festivals and other events around the UK. Check out their website. Stop them and buy one, you like me, will say "Oooooh".